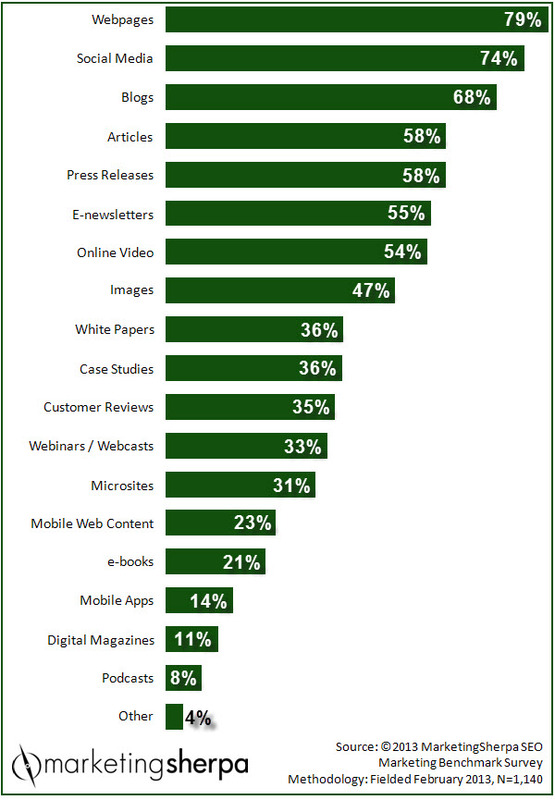 Marketing Research Chart: Which channels do your peers produce content on? SUMMARY: While tactics such as URL normalization and site structure are a few of the many technology elements comprising the brain of search engine optimization, content is at the heart of SEO. After all, search engines try to deliver the highest-quality, most relevant content to users. In this week's chart, we review where your peers focus their content-producing efforts. Where do you produce content to help with SEO? What channels might have you overlooked? Q: What mix of content products do you currently use as part of your total SEO marketing strategy? Not surprisingly, the place most marketers focus their content-producing efforts is on webpages. The website, with its landing pages, is still the hub of conversion for many marketers, so many marketers focus on getting their webpages to rank highly by producing content directly on them. Social media and blogs are also used by a large majority of marketers, likely to help produce fresh content for search engine spiders, as well as strengthen the social graph signals that search engines are measuring. If we break down the data and look at B2C marketers, they focus far less on whitepapers and case studies (10% and 9%) than their B2B and B2G peers (52% and 51%). However, B2C marketers focus much more on customer reviews (44% for B2C versus 27% for B2B). With only 8% of marketers using podcasts as part of their SEO strategy, it begs the question if this channel is being overlooked. After all, podcasts can be transcribed and serve as the source for content-rich landing pages, especially helpful for long-tail search. But much more than that, podcasts are a way to increase engagement and help move your prospects through the funnel. This is an important consideration when choosing which channels to invest your content budget in — think beyond just SEO. Sure, organic search is valuable and will help ensure more possible customers interact with your content. But, SEO shouldn't be the only consideration. At the end of the day, if your content isn't helping your customers through the channels they want to use, whether that is a webpage or a digital magazine, you likely aren't meeting your ultimate objective — ROI.